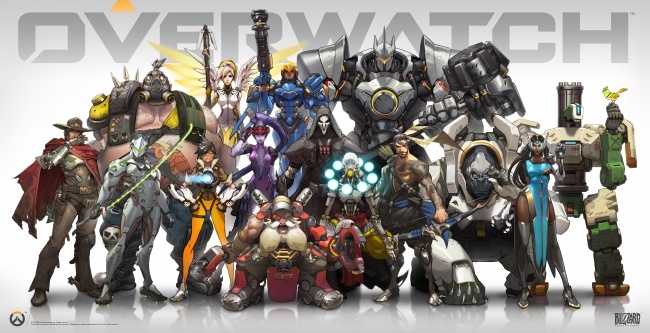 Blizzard is well known for its tendency to make entry-level titles in sometimes hard-to-learn genres. Hearthstone is, in my experience, one of the easiest to learn CCGs ever, and Heroes of the Storm has been likened to the Hearthstone of the MOBA genre. Blizzard is now trying its hand at a team-based multiplayer shooter with Overwatch, and it was good. I was a sucker for Team Fortress 2 back in the day. I played Heavy mostly, dabbling occasionally with a match or two as the Pyro. While TF2 is most certainly a "shooter," it's a very forgiving, fun-over-all kind of shooter, and that's exactly the feeling I got when I played Overwatch at BlizzCon. It is clearly designed around having a good time, rather than optimizing balance between characters, and making sure the maps are perfectly tuned to siphon any possible joy out of the experience. It's very Blizzardy, in the best possible way. You might say it is to shooters what HotS is to MOBAs and Hearthstone is to CCGs. It's highly accessible fun for everybody. I played two rounds of Overwatch's command point capture mode at BlizzCon last weekend, one on offense, and one on defense. There's no push and pull in this mode, instead one team is on defense exclusively, while the other team tries to capture the two command points. For round two, the teams switch places. Super simple. Round one had my team on offense, so I picked a suitably offensive character, Pharah. (If you want detailed info on each of the 12 announced characters, check out GameFront's extensive rundown.) 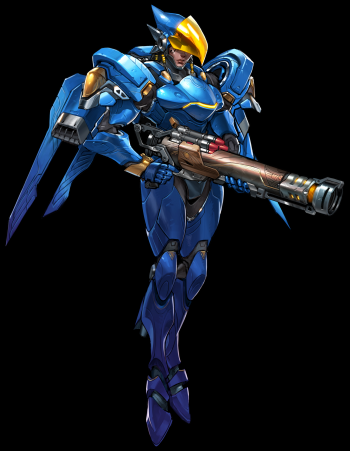 Pharah's Rocket Launcher isn't the big hulking kind of shoulder-mounted behemoth you're probably used to, but it does have a nice blast radius, which reduces your dependence on being a crack shot. Just aim for the wall or ground near your enemies and blast away. Her Jump Jet is fantastic for expeditious retreats from sticky situations, especially when combined with her in-air glide. I racked up quite a few kills (maybe most of them were assists, but who's counting, really?) and had a blast (hahaha rocket launcher pun. ZING!) doing it, but I was a little disappointed in her ultimate ability, which is a barrage of little rockets. I used it several times during the match, but was immediately murderized before she ever got more than a couple of them launched. It'll definitely require a little practice, or at least more subtlety than I possess, to use her ultimate effectively. Pharah's mobility, however, is second to none. She has access to the super-high jump ability, which pairs well with her glide to get you over even the highest of walls, and offers great avenues for surprise attacks. She's in and out of combat in a flash, often airborne the whole time, which makes her a much harder target for others relying on splash damage. Forgiving aiming and incredible mobility make her an excellent choice for newer players, or those like me who just aren't great at shooters. Playing defense was a whole different experience, though. While you're attacking, you're constantly on the move, trying to find new angles from which to destabilize your opponents' defenses, but while you're on D, you're really just trying to hunker down and prepare to weather the storm. 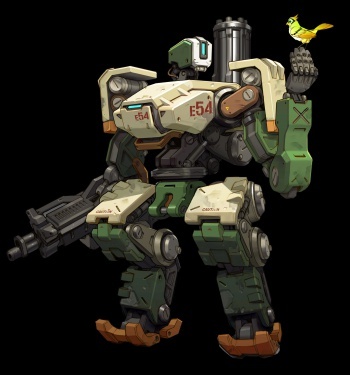 At least that's what I did, as I was playing the adorably robotic Bastion. His special transforms him into a super-high rate-of-fire turret, complete with shield. He's harder to take down than you might expect, as was evidenced by my 16:1 KDR that match. My only death came from the teleporting Tracer, who managed to get behind me and take me down before I could un-turretify myself. Defensive strategies are going to vary, of course, with some players/team opting for a more aggressive approach. I, however, was perfectly content to sit back and wait for the opposing team to show their faces near the command point before I laid waste to their squad. Despite hunkering down for the entire match, it was still exciting, as the attackers took to various tactical methods, like attacking from multiple directions and elevations simultaneously. Given that Blizzard only announced Overwatch a few hours before I played it, it stands to reason that this was an incredibly early build. Even so, I didn't sense any particularly egregious flaws, and everything from the characters to the maps seemed more polished than a lot of Betas I've dabbled in. While I'll withhold any real judgment until I get to spend a *lot* more time with the game, at a glance, it seems like it's just what I've been looking for: The Hearthstone of shooters.